Jim Hardin pitched for the Orioles from 1967 to 1971. Early-on, he and Tom Phoebus backfilled a rotation decimated by injuries to Jim Palmer and Wally Bunker. After a few years, Palmer recovered and returned to the Orioles’ rotation, and Mike Cuellar was acquired from the Astros. Having served his purpose, Hardin moved on to the Yankees. Hardin was signed by the Mets, and played in their farm system from 1962-1965. After the ’65 season the Orioles acquired him in the minor-league draft. 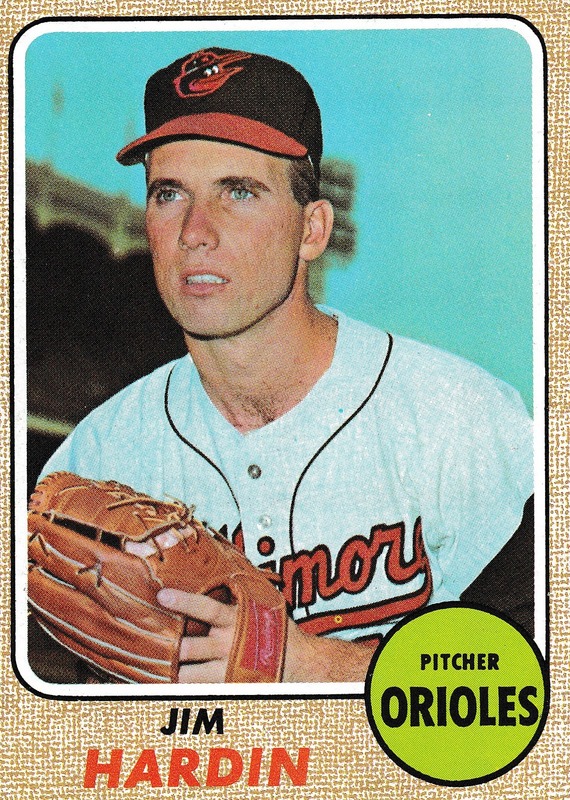 He made his Orioles’ debut in June 1967, after the above mentioned injuries decimated the starting rotation (also including Dave McNally). 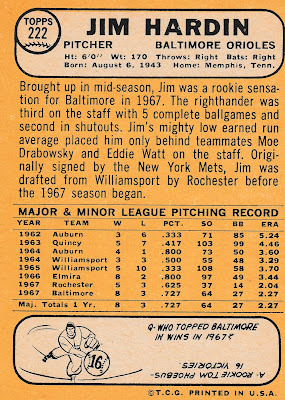 Jim was 8-3 as a rookie, and won 18 games in 1968 as the O’s #2 starter behind a fully-recovered McNally, who won 22 games. 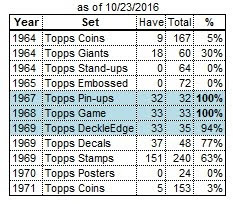 He slipped to 6-7 in 1969, but by then was the #5 starter behind Cuellar (23 wins), McNally (20), Palmer (16) and Phoebus (14). 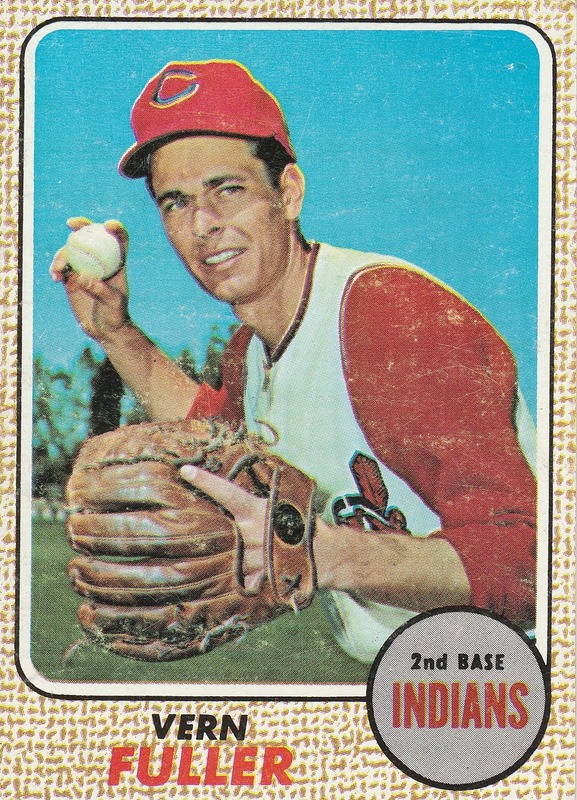 Hardin pitched one more full season with the Birds (1970), and although they won the World Series, it was a down season for him personally, posting a 6-5 record. He and Phoebus (5-5) were the forgotten members of the rotation, as the Big Three all won 20+ games and made 40 starts each. 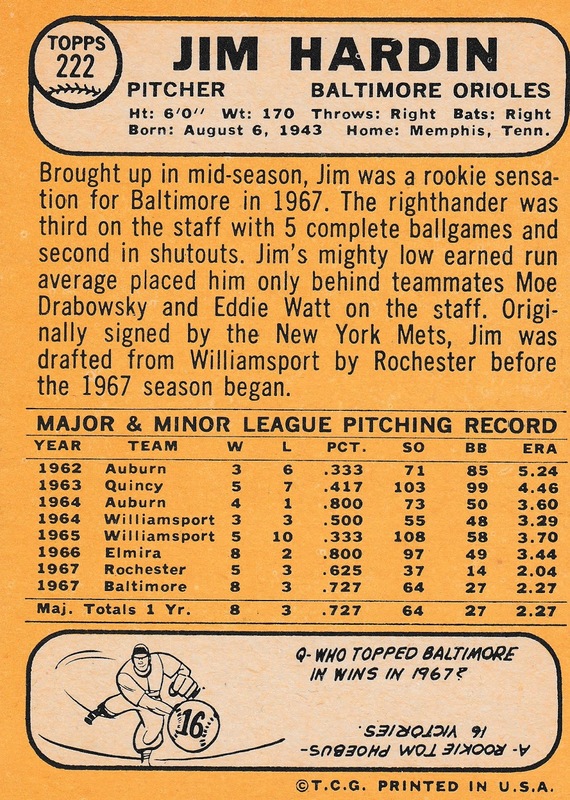 Jim was traded to the Yankees in May 1971, and after another bad season was released the following April. He was picked up by the Braves a few weeks later and pitched 26 games (mostly in relief) in his final season. After his playing career, Hardin became a small aircraft pilot. He was killed in 1991 when his 6-seat plane crashed in Key West, FL. He was 47. 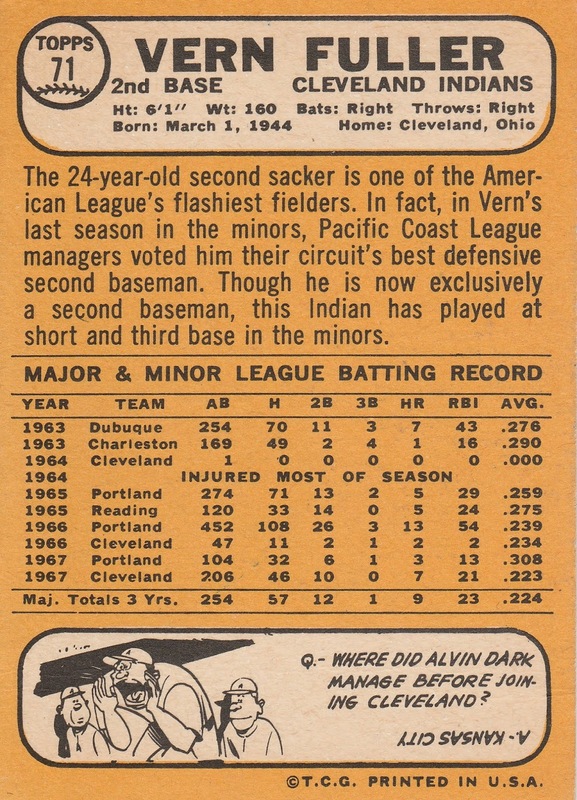 This is the rookie card for Vern Fuller, the Indians' starting 2nd baseman for most of 1967-1969. 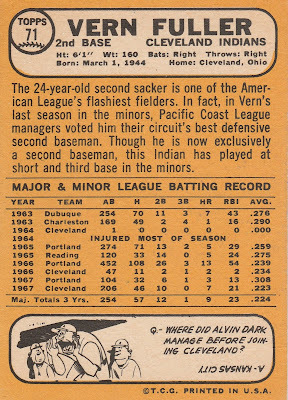 After a season in the minors, Vern missed almost all of 1964 with injuries, playing no minor-league ball and only 2 games with the Tribe in September. 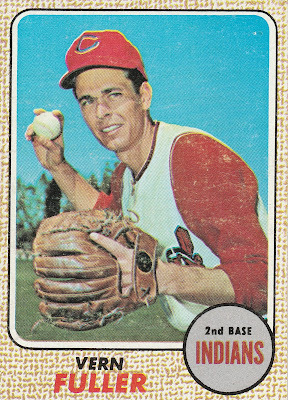 He played all of '65 and '66 back on the farm, save for a September call-up in 1966. Fuller was up and down between Cleveland and triple-A for the first half of 1967, but was recalled in mid-July and started 62 of the final 73 games at 2nd base, replacing the floundering tandem of Gus Gil, Pedro Gonzalez, and Chico Salmon. In 1968 Vern split the 2nd base duties with Chico Salmon for the first half of the season, and with rookie Dave Nelson in the second half. 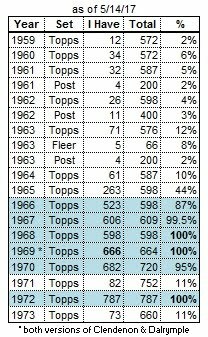 Surprisingly, even though Nelson was named Topps all-rookie 2nd baseman in 1968, he only started 30 games in 1969, mostly from late-July to mid-August. Meanwhile, Fuller started 72 games, with newly-acquired bust Zoilo Versalles playing some games there as well. Rookie Eddie Leon took over in 1970, relegating Fuller to just 33 at-bats in 29 games for the season. He only made 1 appearance between 6/12 and 8/18, and spent no time in the minors, so maybe he was injured for a good chunk of the season? Anyway, he retired after the season.